El Torero is a popular creative effort by Merkur and takes inspiration from the feisty and fun world of Spanish bullfighting. The graphics of this online game feature a bull, matador, roses, guitar, a woman with a fan, and the 10, Jack, Queen and King. This popular reel game takes the player to a world of bullfighting with animations and music that match the unique landscape and keep the player invested in the slots. Whether you want to play manually or allow the automatic feature of the game to take over, there is something for everyone with this slot. The El Torero casino slot machine features a video slot setup, allowing the play to show animations to entertain the player. This gambling machine has and three rows and five reels, but has variable paylines, allowing the game to have between 1 and 10 select paylines. A basic win occurs when the player is able to get three of the same symbol to appear on the same pay line, even though two of the same symbols will also result in a smaller prize. Considering that the wagers can range between $0.01 and $20.00, the results of playing this slot is the potential for low, moderate, and high winnings. There are both Scatter and Wild symbols that appear while you play El Torero slot machine online. The Wild symbol is the famous matador, which appears and transforms all of the symbols into the one that will result in the greatest value for a line win. El Torero also features a Scatter symbol, the bull, which triggers a round of free spins as long as at least three of the bulls appear anywhere in the playing field. The ten free spins lock the bulls into place, allowing the player to experience a higher chance of landing a jackpot. 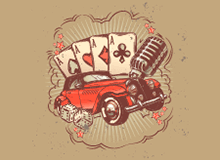 Of course, these Wild and Scatter symbols are not technically a bonus round, but they are beneficial for those seeking to land the jackpot. Speaking of the jackpot payout, it is important to discuss the way that the wagers work within El Torero. As previously mentioned, the minimum wager that you can place while playing this slot is $0.01, and the maximum wager is $20.00, a rather significant amount for a slot game. However, the wages work on a per line basis, meaning that the player has the option to bet on all ten pay lines for a minimum bet of $0.10 and a maximum bet of $2.00 for each line, totaling $20.00. The payout on the jackpot, if you manage to win on all ten lines, is $2,000 or 2000 coins, depending on whether you play El Torero for real money or not. For novices, a lot of online casinos offering this game will give you a 1,000-coin credit so you can learn how to play El Torero free and see how the Scatters, Wilds, and line betting stack up with each other. 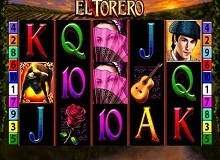 The payback value for the El Torero is another important element of this slot to examine. After all, the return to player (RTP) amount provides a hypothetical look at the expected outcomes. For the El Torero slot, the RTP is 96.08%, which is a rather significant figure when compared to other slot games, but the overall coin or money return is rather low. Still, there is a potential for making money and having fun when playing the El Torero game. 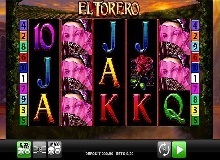 El Torero is a game of chance like any other slot. In order to increase your chances of a good payout, there is not much you can do. Taking the time to play the game online allows you to practice seeing the various interactions of the pokie and become familiar with its intricacies. 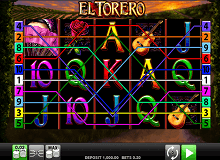 Overall, El Torero is a fun 5×3 reel gambling machine which offers the player the ability to play online for coins or real money. It offers a refreshing theme in the gaming community because it utilizes the fiery Latin-inspired reel art and characters. Players interested in playing this slot should try the free online version first to see how they like it. Then they can move into the exciting realm of playing this game for real money. So feel free to step into the bullfighting ring and challenge the bull.